With a stay at DoubleTree by Hilton Hotel Port Huron, you'll be centrally located in Port Huron, walking distance from Blue Water Bridge and close to Fort Gratiot Lighthouse. This hotel is within close proximity of McMorran Place and Canatara Beach and Park. Make yourself at home in one of the 149 air-conditioned rooms featuring refrigerators and microwaves. LCD televisions with premium TV channels are provided, while complimentary wireless Internet access keeps you connected. Private bathrooms have complimentary toiletries and hair dryers. Conveniences include phones, as well as safes and desks. Be sure to enjoy recreational amenities, including an indoor pool, a spa tub, and a 24-hour fitness center. Additional amenities at this hotel include complimentary wireless Internet access, gift shops/newsstands, and a television in a common area. Grab a bite to eat at the hotel's restaurant, which features a bar, or stay in and take advantage of room service (during limited hours). Quench your thirst with your favorite drink at a bar/lounge. Full breakfasts are available daily from 6 AM to 10 AM for a fee. Featured amenities include a 24-hour business center, express check-in, and express check-out. Planning an event in Port Huron? This hotel has facilities measuring 10530 square feet (948 square meters), including meeting rooms. Free self parking is available onsite. 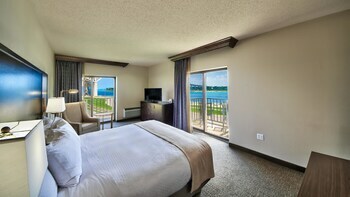 DoubleTree By Hilton Hotel Port Huron is the perfect Port Huron lodging choice for your trip to Michigan. With numerous amenities for guests such as gift shop, jacuzzi or spa, dry cleaning service, you will wake up at DoubleTree By Hilton Hotel Port Huron feeling refreshed every day for your time in Port Huron. Don’t let this amazing reservation opportunity pass you by, book your stay at DoubleTree By Hilton Hotel Port Huron today to make the most of your time in Port Huron, Michigan.